No good can come of The Flash playing around with an alteration to the speed of light. Seriously, outside of silencing a profound burst of scientific curiosity, what purpose can such a pursuit really serve? You just know there's going to be an evil super genius or a time warp or something hiding back there, and then Barry's going to have his whole afternoon spelled out for him. But experiment he must, and wrong everything oh so naturally goes. 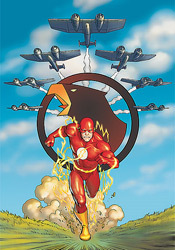 Turns out there really was a time warp waiting for him, and now today's Flash is sprinting around in the era of World War II, interacting with the Blackhawks and trying to explain his outfit, his identity, and how he's different from Jay Garrick, the silver-helmed Flash of the day. J. Michael Straczynski's plot would feel right at home back in the Silver Age, when science didn't really need to have a distinct purpose and writers could smudge the details as much as they wanted. In a way, that kind of innocence is genuine and adorable. For instance, I couldn't help but smile when I saw the little yard markers Barry's scientist buddy had set up on the grassy knoll he'd chosen for testing their experiments. Either he's laid down somewhere in the neighborhood of ten thousand of those things or a man sprinting at the speed of light will lose sight of them after his first step. But when we're talking about a guy who can run quickly enough to teleport himself sixty-odd years backwards in time, those details are more of a flamboyant accent and less of a point of concern. Still, I was hoping for a bit more meat from this story than Straczynski provided. I admire his respect for the format, telling a string of self-contained stories over the course of his run, but this may have been too ambitious of a project for it. We cover so much ground in so few pages that it starts to feel like nothing is carrying any emphasis. There's a solid morality crisis in the middle of the issue, as Barry struggles with his vow to never take another's life while wearing the crimson and gold amidst a Nazi shelling, but it's over and done with after a couple panels. There simply isn't enough time to spread it out any longer. Jesus Saiz's accompanying artwork has its hits and misses. In some of its stronger panels, his work fits the era nicely; a clean, crisp, down-to-earth style that's half Steve Dillon and half Joe Kubert. In others, Saiz attempts to modernize things just a bit too much. He understands the nuances of good visual storytelling, but that constant flux between an era-appropriate style and something that's undeniably modern kept me persistently off-balance. In the issue's later pages, he manages to marry the two with some success, but by then the bulk of the story's drama has already passed. He does good work, but just took a bit too long to find solid footing. I can understand that the big draw here is the oddball teaming of a modern superhero with a squad of soldiers from the distant past, so it came as no surprise that the vast majority of this issue was spent on their interactions with each other. But when an entire month's worth of action, the climax of the story, is blown through in a single-page montage, I can't help but feel somewhat shortchanged. This is a fun little stroll through time, nothing to take too seriously, but decent enough entertainment for a lazy half-hour over the weekend. It fits into its single-issue shell, but not without making a few clear sacrifices. Flip through it and move on with your life.